Kunze Chimed with a thangka of White Tara. White Tara, known as Sita Tara in Sanskrit, is worshipped as the mother of all Buddhas and an embodiment of the maternal aspect of compassion. Her white color is a symbol of purity, the immaculate truth of the Dharma and perfectly pure wisdom. She is also associated with long life, the healing of physical and mental illnesses, and the elimination of difficulties that appear on the road to the ultimate goal of enlightenment. Her power is related to the prevention of accidents, natural disasters, lack of physical vitality, and anything that could endanger life. The white form of Tara is very popular in Tibet, where she is known as Drolma Karmo or Drolkar. In the pantheon of Tibetan Buddhism, she serves as the main deity of longevity together with Amitayus and Ushnishavijaya. 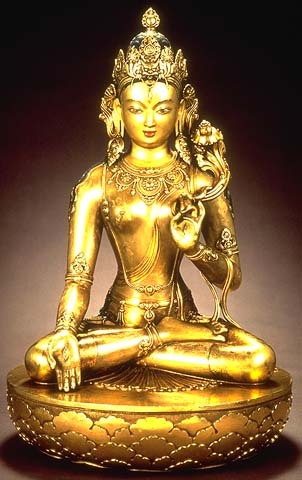 Tibetans worships Tara as one of the most important deities along with Avalokiteshvara, the bodhisattva of compassion. They recognize her enlightened nature reincarnated in women with extraordinary qualities. This tradition is spread through the regions of Tibetan Buddhism, including Mongolia. White Tara statue made by Zanabazar. Mongolian yogini Kunze Chimed is accepted in her home country as an emanation of White Tara. Her divine voice and noble Dharma activities inspire Buddhists all over the world. 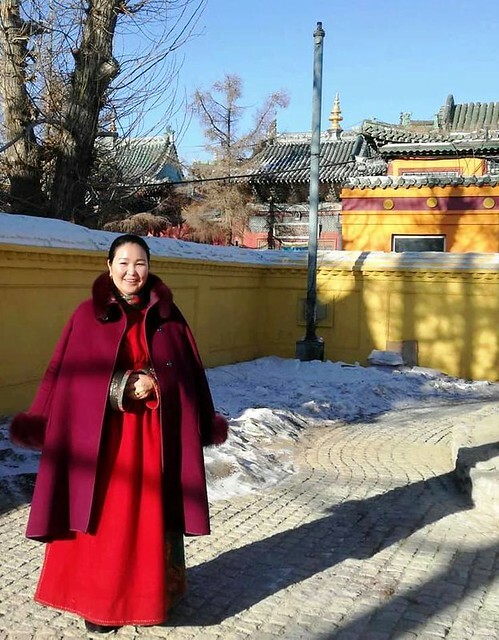 She is a devoted Dharma practitioner, a brilliant performer of mantras and prayers, a lecturer, a translator of Dharma books, a director of a Buddhist women’s association called Buman Khand (Million Dakinis), and a loving mother of two kids. Kunze Chimed has a special connection with White Tara and has recorded many beautiful prayers and mantras dedicated to the female deity. Her last album contains a prayer to White Tara with an intriguing history. The album, called Mantra, was recorded in May 2018 in White Arch Studios, in the Khan Uul district of Ulaanbaatar. Kunze Chimed worked together with music composer and producer Turkhuu Bayasgalan. The prayer to White Tara performed by Kunze Chimed combines elements of Sanskrit, Tibetan, and Mongolian languages. It is based on A Praise to White Tara written by the First Dalai Lama, who also had a special connection with the Buddhist goddess. Gendun Drub (1391–1474), who was considered posthumously to be the First Dalai Lama, was one of the most esteemed scholar-saints of his time. He was a student of the eminent Gelug teacher Je Tsongkhapa (1357–1419) and the first abbot of Ganden Monastery, founded by Tsongkhapa himself. Gendun Drub founded the great Tashilhunpo Monastery and remained its abbot until his death. Like all Dalai Lamas, he was identified as an emanation of Avalokiteshvara. And never leave me, even for a moment! The echo of his words can be heard six centuries later in the melodious voice of Kunze Chimed. The melody of the prayer to White Tara was inspired by the musical record of the same prayer performed by the Fourth Jamgon Kongtrul Rinpoche of the Kagyu school of Tibetan Buddhism. He was born in 1995 in Nepal and enthroned by the late Penor Rinpoche, who was invited to Karma Monastery in Bodh Gaya for the ceremony in 2000. In 2016, Jamgon Kongtrul Rinpoche abandoned his monastic vows. It was during the same year that he recorded the prayer to White Tara. When Kunze Chimed heard it, she was deeply touched and inspired to record her own version. Her magical voice transmits the blessings of White Tara beyond time and space. The vibrations of the mantra and the prayer have a healing and pacifying power, and listeners can feel the enlightened energy of the Buddhist goddesses along with the devotion of the Mongolian yogini. Kunze Chimed has performed a praise to White Tara on many important occasions both in Mongolia and abroad. 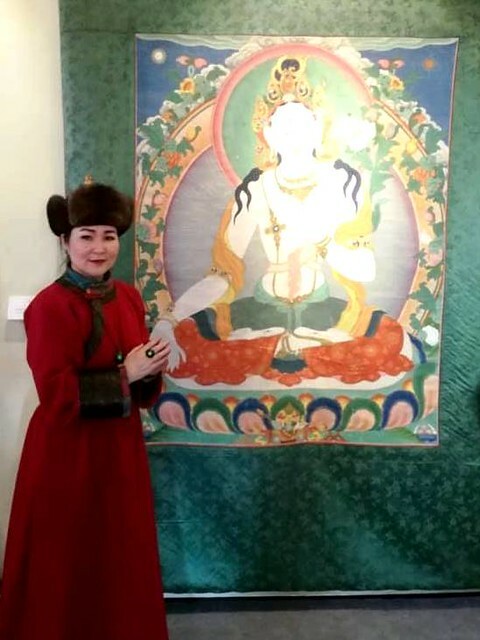 One of the most emblematic events showing the devotion of the Mongolian people to Tara is the “White Tara” exhibition that is combined with a one-day ritual to create an image of the goddess that takes place at the Bogd Khan Palace Museum. The Bogd Khan (“Great Emperor,” a title for the highest lama in Mongolia) Palace, built between 1893 and 1906, is one of the most important historical monuments in Mongolia. It was nationalized in 1924, restored in 1961, and transformed into a museum in 1974. During the reign of the Eighth Bogd Khan Jetsun Dampa Khutuktu (1870–1924), there was a tradition to create a White Tara image in compliance with the divine proportions developed by the eminent scholar and talented sculptor Zanabazar (1635–1723) during the eighth day of every month. The ritual was performed for the last time in 1924. However, the Bogd Khan Palace Museum revived it in 2013. In February 2018, the director of the museum, Mr. Mendsaikhan, invited Kunze Chimed to participate in the “White Tara” exhibition with a recitation of praise to the Buddhist goddess. Her divine voice invoked the blessings of Tara along with 52 images of the female Buddha. Reciting praise to White Tara, Kunze sent her wishes for Mongolians to live long lives and have good fortune.